The final season of Voltron Legendary Defender premiered this weekend on Netflix. I watched it sporadically during the weekend, finishing up this morning as I was wrapping some Christmas presents. I'm certainly sad to see this show go. Not only was it the best damn robot show on tv, but it was just a damn good show. I appreciated the drama and comedy that fleshed out the characters and situation that made the show more than it could have been. 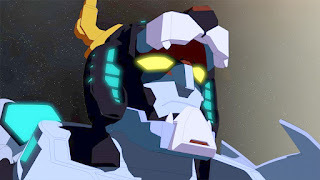 Not to mention as a lifelong Voltron fan, it was great to see the series get a solid cartoon that not only looked cool, but also delivered on substance. I enjoyed buying the toys that Playmates made for the short time they were out and hope to see some of the designs from the show make it into toy form at some point, even if unofficially. Between the various Robeasts, mecha piloted by big bads (would those be Robeasts too? ), and the various Voltron formations (not to mention the Atlas). There was some great robots on display. It's been a fun ride, the past few years with Lion Force. If this is Voltron's last show (for awhile or ever) then I'm glad it was such a good show. The previous entries never felt right to me, while this was wonderful. I hope if we see Voltron again, be it lions or vehicles, or even Gladiator, it's just as good if not better than Legendary Defender.